Most of the batteries that we use everyday do not require any special preparation before recycling, however we do recommend that precautionary measures be taken when recycling certain types of batteries to reduce any risk of short-circuit. Special consideration must be taken to ensure all primary lithium "button" cell batteries have their positive terminals taped prior to recycling. We recommend taping both the positive and negative terminals by simply placing a single piece of tape around the top and bottom of the button cell covering both terminal ends. Button cell batteries are used in many applications such as musical greeting cards, watches and hearing aids. Aside from the various button cell sizes, there are the more common AAA, AA, C, D and 9 Volt varieties. All of these batteries must have their positive terminals taped before recycling. Sealed Lead Acid batteries are commonly used to power emergency lighting systems, UPS power units, remote control cars and vehicles. The sizes of these batteries vary depending on the application and each must have their positive terminals taped before recycling. 6 Volt batteries are the type used in larger flashlights and lanterns. Although not subject to the Transportation of Dangerous Goods Act, we recommend that the protective caps or masking tape be placed over its terminals prior to being recycled as well. 9 Volt batteries are the type usually found in smoke detectors and alarm clocks. Simply place a piece of masking tape over the terminal ends to secure both the positive and negative terminals. The positive terminal on a battery is marked with a + symbol or may be identified as the red terminal on the Sealed Lead Acid variety. To properly secure a battery, simply place a piece of masking tape over the positive terminal end so that it may not come into contact with metal or other batteries. On 6 Volt batteries, place a piece of masking tape around the terminal springs to prevent smaller button cell types from being wedged in-between the terminal. Consider reusing the package from the replacement battery to secure the used battery. Simply place the used battery inside the package and if needed, seal the package with a piece of tape. If multiple button cell batteries need to be prepared for recycling, simply use a longer piece of packing tape and place each button cell side by side with the positive terminal against the tape. To ensure that the batteries stay together, place another length of packing tape over the negative terminal ends. Every battery that is recycled at RMC is sorted by type and chemistry. Place enough tape to safely cover the positive terminal. Avoid wrapping the entire battery in tape or taping different chemistries together. Most of us have a place (or several) where we store our used batteries before we make the trip to our local retail recycling location. Below, we've listed some useful suggestions and considerations about storing your used batteries. All batteries should be kept safely out of reach of small children. Lithium button cell batteries found in musical birthday cards can be an attractive item for an inquisitive child. This type of battery is known to cause severe burns of the esophagus when swallowed which has in some cases resulted in death. If you suspect your child has swallowed a battery of any type, you should contact your local emergency services immediately. Store used batteries in a cool and dry area. Batteries should not be stored in extreme heat, near flammable materials or in locations where there is moisture or humidity. As an added safety precaution, use a non-conductive storage container such as a plastic pail or cardboard box rather than using a metal coffee can for storage. Do not store batteries with flammable materials or conductive materials like metal, paperclips and staples, etc. Ensure coin, 9 volt, sealed lead acid and lithium batteries are taped or individually bagged prior to storing. Remember to tape the positive terminal ends on all of the battery types listed above to reduce any risk of short-circuit. Do you live in Ontario, Canada? If so, you can search for a store near you that recycles batteries. Simply type your postal code or city name into our search tool. 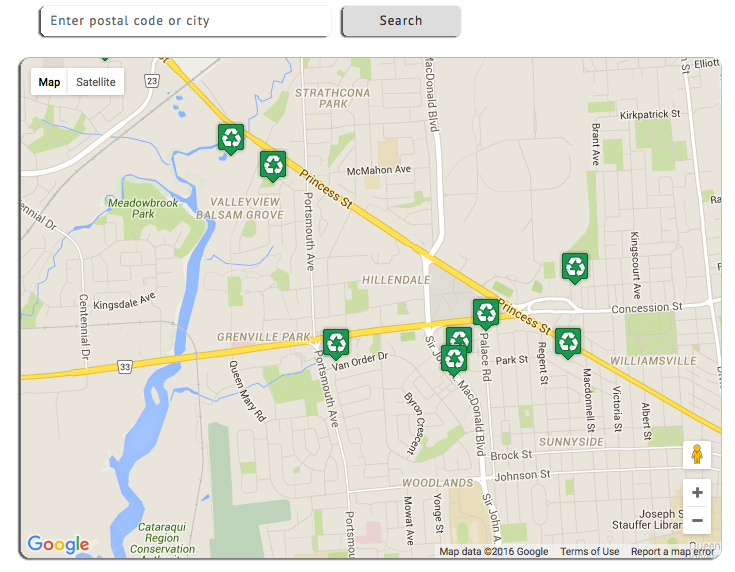 If you live outside of Ontario, check with your local municipality to find your closest recycling point.